Last year, Governor Paul LePage pulled out of the NGA... or so he thought. The Bangor Daily News reported that LePage pulled the state's membership in the National Governor's Association because they weren't receiving enough benefits for their membership dues to warrant remaining in the association. At the time Maine was paying $60k to belong. One would think that a prestigious group like NGA would not like losing members and would do something to convince Maine to stay in. So what did NGA do to try to retain this member? The answer is nothing. Jodi Omear, director of communications for the NGA, explained that merely being elected governor of a state is all it takes to be a member. She is quoted by BDN from an email stating that " LePage is still considered a member of the organization even if the state has stopped paying dues. All the governors of the 50 states and five territories are members, even if they do not pay dues." Quite an organizational structure. You get the full credibility of claiming 100% participation by all 50 states which implies that they are all behind your policies and programs, without having to actually get their permission (or money) to belong. Sure does come in handy when you're saying things like, all the governors are behind common core standards. Why did LePage leave? “I get no value out of those meetings,” he said. “They are too politically correct and everybody is lovey-dovey and no decisions are ever made." Perhaps the meetings are not the point of membership Governor LePage. Omear said that, "Almost all states pay the full amount of dues every year, and those that do receive additional services, such as technical assistance from NGA staff, grants from the federal government and foundations that are managed by NGA and policy academies that share best practices among states where travel and attendance of state employees are funded by NGA." If you pay money to NGA you get federal government grants. Kind of sounds like a pay to play deal. 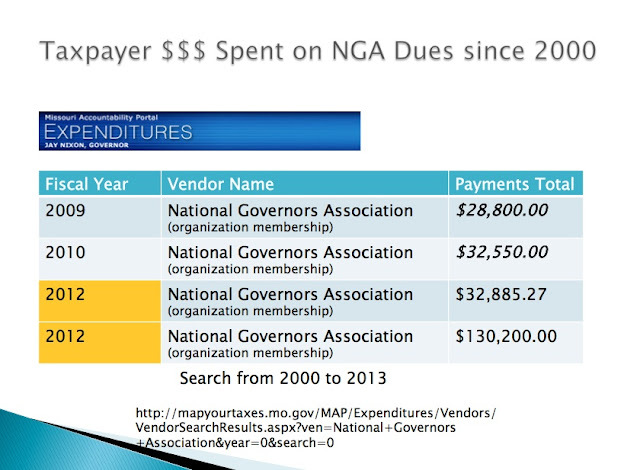 First line of a federal grant application "Does your state pay dues to the NGA?" Check. Then you are eligible to receive money. 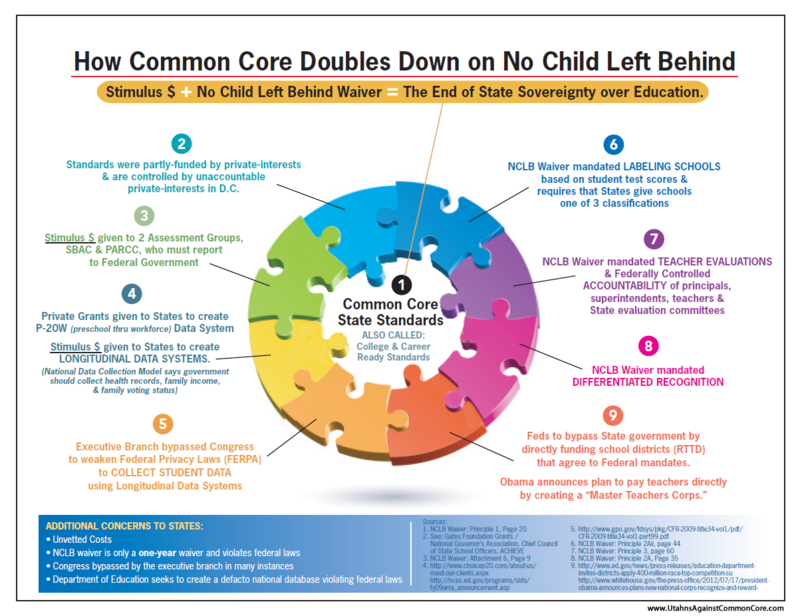 Dane Linn of the Business Roundtable and former Director of the NGA Education Division seemed to indicate in his report for the American Enterprise institute that the development of Common Core Standards was a way to keep federal intrusion into education at bay. However, if you are paying money into NGA to be eligible for federal dollars, then how exactly are you keeping federal intrusion at bay? The "you scratch my back, I'll scratch yours" phonmenon becomes even more obvious when you look at the Federal Race To The Top grant applications which required states to adopt a set of common national standards to even be considered for a grant award and the only ones that existed were those developed by NGA (and CCSSO). 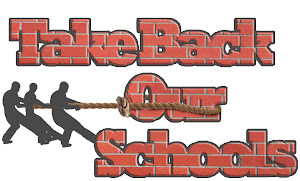 Still trying to figure out how common core kept the federal government at bay Mr. Linn. Omear explained that all states pay different dues ranging from a low of approximately $22,000 to a high of about $176,000 a year. She would not reveal which states are currently paying, so we decided to do a little digging on Missouri's dues. Dues are listed in the Missouri Accountablity Portal. Here is what we have paid for Governor Nixon to belong. How does that compare to his predecessors? Using the same sources, we find no NGA membership dues paid by Governor Holden in 2001-2004 and none paid by Governor Blunt 2005-2008. Are we getting the best bang for our buck? Missouri appears to be in the top pay to play category. We should see a lot of grant money rolling into our state. 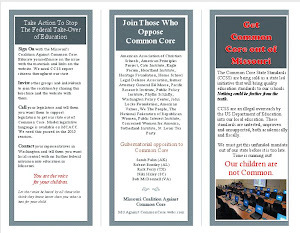 Maybe this explains why Commissioner Nicastro told legislators that they expect to get more funding to implement common core. I guess this is a great example the liberals could put forth to prove there is no room for spending reductions in our (or once was ours) bloated federal government.